Often, people ask me how I began my photography career. The early part was pretty simple. I was visiting Japan and picked up a Nikon camera and a couple of lenses. I then moved to Alaska and bought a darkroom setup at a garage sale, bought a little book on how to mix the chemicals, operate the enlarger and so on; I then called myself a photographer. I found work running the darkrooms for several Alaska photographers, stumbled into some publishing opportunities (there wasn’t much competition in those days) and ended up working for a publisher of Alaska regional travel guidebooks. In this way I wrote my first book, a travel guide to Prince William Sound, a vast and convoluted embayment east of Anchorage. While sailing in the region, I had heard of an interesting, very shy hermit working as a caretaker at an old herring rendering plant that had been made into a lodge of sorts. The lodge was on remote and rugged Knight Island, far from any road. The hermit, George Flemming, would run and hide at the approach of a boat. I had seen a fuzzy photo of him, sort of like a fuzzy snapshot of an elusive sasquatch, and knew I wanted to photograph him. We visited with the owner of the lodge, and she gave me permission to enter his vacant quarters. I left an apple on the table. In the Alaskan bush, apples and any other fresh produce are practically worth their weight in gold, and after some time, George, who had been raised to be polite by his Aleut mother and fur trapper Caucasian father, came to say hello. A friendship was born. For several days we just talked, and then I asked to photograph his sole wintertime companion, Toodles the Poodle. After that I took hundreds of photos of him and he could never figure out why I was interested in him. One day I took this photo of him at the oars of his boat. George had never ridden in an automobile, but he could handle himself on the water, even though he was nearly blind. The photo was widely published in magazines, calendars and more. As time went on, I did what I could to take care of George. Finally, a friend offered his bushplane to fly him to Anchorage, where the whizzing autos and compressed population were almost overwhelming. George had never been to a doctor or dentist in his life, so we had his eyesight checked. Unfortunately, the doctors said there was nothing they could do. The same went for his teeth. I made sure he had time to browse the tools in Sears, an unheard of luxury for a caretaker and handyman who lived far from any town. He also received the first professional haircut of his life. After his few days in the city, I bundled him back aboard the plane to his island retreat. It was the last time I saw George. I moved from Alaska. The lodge burned, victim to a chimney fire. 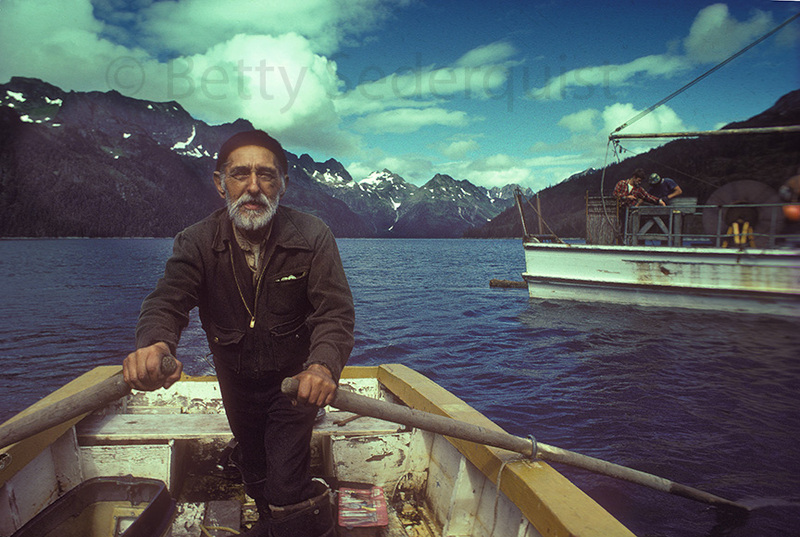 George then moved to Cordova, a fishing village of 2,000, and he lived his last years there, dying in the early 1980s when he was about 82. In recent years some of his nieces and nephews (George never married or had children) have contacted me and I have shared photos of their amazing relative.